The travel industry has come a long way in just a few short years. A little over a decade ago, travel meant hopping in the family car with a glove compartment full of maps or boarding a plane for several hours, touching down at a destination with loved ones far from home, phones, and television. The question of "Does our hotel have Wi-Fi?" likely never passed a traveler's lips -- mostly because Wi-Fi didn't even exist. If you're reading this now, there's a good chance you remember these types of travel experiences. And if you're reading this now, there's probably an even better chance that you're reading this on your smartphone. In addition to being at your side for a good part of your workday and daily activities, your smartphone has become a travel companion that doesn't require an extra plane ticket or hotel room of its own. In 2012, Prosper Mobile Insights revealed that 98% of people they had polled took their smartphones and tablets with them on vacation, while 80% of this group mentioned that they used them "all the time." So, what exactly are travelers using their smartphones for while they're on vacation? Of those polled, 84.6% use their mobile device to check personal email. Email on vacation seems to be the preferred communication method since only 67% used their smartphones to call or text people back home while on vacation. Surprisingly, only 57.7% used their phones to document their travels with photos or updates on social media. Using GPS and map apps was also popular with 67% of vacation travelers, while nearly 62% used their mobile devices to queue up their itinerary and find popular attractions, things to do, sites to see, and where to eat. A little over half (53.5%) of those queried said that they used their mobile device to entertain themselves and stay occupied while traveling by plane, train, or automobile. (Perhaps they wanted to avoid tangling up with a Steve Martin or John Candy type en route to their destination?) A similar number of travelers (54.8%) used their devices to read or watch movies and TV shows while lounging by the pool, on the beach, or in their hotel room. In addition to standing in as your personal photographer while you're on vacation, phones can be used to snap up deals on hotels and travel fare, shop around for the best prices on hotels and rental cars, and to occasionally book travel. However, a study by EMarketer revealed that tech-savvy travelers are still hesitant to finalize their bookings via their smartphone's browser. Emarketer's study concluded that 89% of travelers who wanted to purchase plane tickets and 73% of travelers hoping to reserve a car immediately used the "call business" feature of the site to speak with a representative directly rather than finalizing their purchases through their smartphone's browser. Lately, there has been a shift to "responsive design" of websites due to the growing use of mobile technology. Responsive design morphs a site to fit the screen it's viewed on for a user experience that requires a minimum of scrolling and "pinching" of pages if viewed on a smartphone or other mobile device. While more and more websites overall are using responsive web design, some car, airline, and ticketing sites may still be a bit too much to navigate from a smartphone. 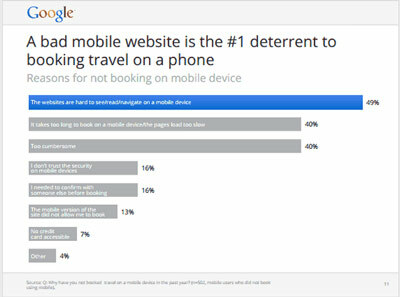 In fact, a 2012 Google research study found that "a bad mobile website is the #1 deterrent to booking travel" on a smartphone browser. Your Smartphone Will Even Help You Pack! So, now that you've used your mobile device to shop for deals and solidify your travel plans, it's time to prep for your trip. And guess what? There's an app for that, too! In addition to helping travelers chart a course for fun before they even reach their vacation destination, smartphone apps are making it easier to figure out what to pack and what they may need depending on where they're headed. 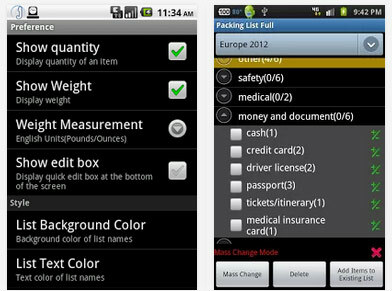 The Android-based travel Packing List app and Packing & Packing Pro apps for Apple devices allow users to create custom lists and offer helpful hints whether they're off to Aruba or trekking through the Alps. Both apps come pre-loaded with features and lists, including reminders to take travel documents and to help estimate the weight of your travel bag -- perfect for travelers flying airlines that tack on charges per-pound for bags over a certain weight. Once your plane lands, the fun begins… But you have to check-in first. Smartphones are beginning to simplify that process, too. Many hotels and travel professionals offer brand-loyalty programs to frequent travelers (and customers) via smartphone apps. And some hotels are beginning to offer mobile check-ins, too. A number of built-in smartphone features are helping travelers make the most of their trips. From GPS navigation to itinerary creation to weather apps that will tell you "whether" you may need to make alternate plans for sightseeing, smartphones offer a number of ways to help enjoy your time away from home. And, of course, you can use your smartphone to take souvenir photos of your vacation to share with friends and family when you return home… or while you're still sitting on the beach!